Former President Olusegun Obasanjo on Wednesday lambasted ex-President Goodluck Jonathan over the latter’s boast to generate 40,000MW of electricity, among other promises made to Nigerians. Obasanjo spoke in Lagos at the launch of ‘Making Africa Work’, a book he co-authored. PUO Reports reports that in attendance were Lagos State deputy governor, Oluranti Adebule, who represented Governor Akinwunmi Ambode. Reacting to a question on why implementation of ideas has been a major problem in Nigeria, Obasanjo said the answer is lack of continuity. 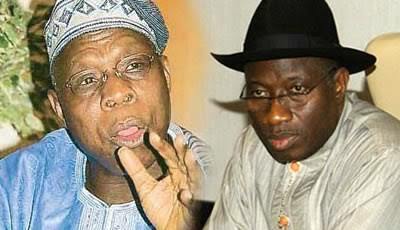 Obasanjo said: “The problem with governments is that they don’t want to engage in continuity. “A government will be sworn in and the next thing you hear is ‘we are the first to, we will be the first to’ do this and that. “So I do ask myself, what do these ones want to do that hasn’t been done. “Before I left government, I formed a team and sent them to different parts of the world to understudy development of countries doing well. “They came back, gave their report and we formed National Economic Empowerment and Development Strategy (NEEDS). We also had States and Local chapters. “When Jonathan came in, they abandoned the programme. I was looking. “Again, before I left, we were able to generate 4,000MW of electricity. We had laid out a plan to increase to 10,000MW in subsequent years. “When they Jonathan came, they boasted that they will generate 40,000MW in 4 years. “I said what! 40,000MW? Do this people even know what they are are talking about? “I thought I should intervene by reminding them that I left a plan that could generate 10,000MW which is more realistic. “Then I sent someone, who I won’t disclose, to Jonathan. I said go and lecture this man. Let him know what is possible and what is not, so they don’t keep deceiving him.